The Epson WorkForce Pro GT-S50 has been discontinued. No direct replacement is available. The high-volume business scanner for busy workgroups. The Epson WorkForce Pro GT-S50 document image scanner offers an amazing value with its remarkable reliability, powerful performance and easy-to-use features. With a daily duty cycle of up to 1200 sheets, plus a 75-page feeder, it"s ready to tackle any task in busy office environments. 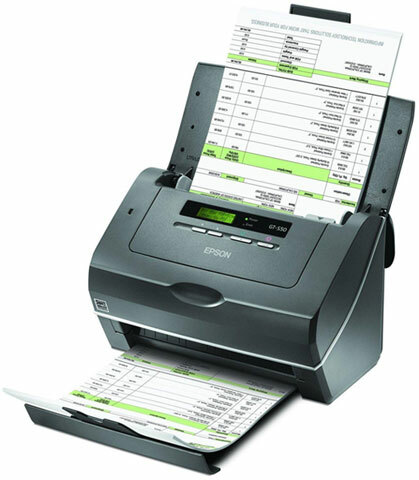 Scan everything from business cards to rigid ID cards and documents up to 8.5x36 inches. The WorkForce Pro GT-S50 easily scans both sides of one sheet, in color, grayscale or bi-tonal, in just one pass. It"s never been easier to electronically capture critical documents. Whether you need a faster way to access shared documents, a more affordable way to comply with government mandates or a better way to maintain the integrity of important documents, the WorkForce Pro GT-S50 is the perfect place to start. Sheetfed scanner, 600 dpi, 75 sheet capacity, 25ppm. Includes: Image Scanner, CD-ROM with scanner software, CD-ROM with PaperPort software, Start Here poster, Hi-Speed USB 2.0 cable, AC adapter with power cable, Carrier sheet. Power supply also included.